DuraVision monitors offer robust performance and a high degree of mounting and housing flexibility for a wide range of industrial environments. 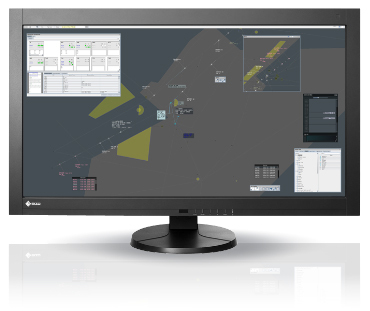 The Duravision FDH3601 is a 4K x 2K large monitor solution for air traffic control that offers exceptional image quality and split-screen configuration. This offers air traffic controllers a new way of displaying information such as viewing a single 4K x 2K image across the entire screen or a 2K x 2K image and auxiliary information simultaneously. 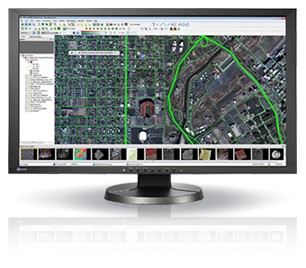 The DuraVision FDF2405W is a full-HD monitor for geographic information systems. The monitor converts 120 Hz input signals to 240 Hz to reduce ghosting and blurring caused during frame changes for high visibility and reduced eye fatigue. It also utilizes an active shutter 3D system that synchronizes the monitor’s refresh rate with the signal from 3D glasses to produce 3D images. At EIZO, we develop, manufacture, and test our monitors at our own facilities and factories. These models are built for 24-hour use and are backed by a 2-year manufacturer’s warranty for maximum reliability in security and surveillance environments.